The Smithsonian Institution, the world’s largest museum and research complex, owns a staggering 13 million photographs, making its collection one of the largest and most diverse archives of photographs in the world. 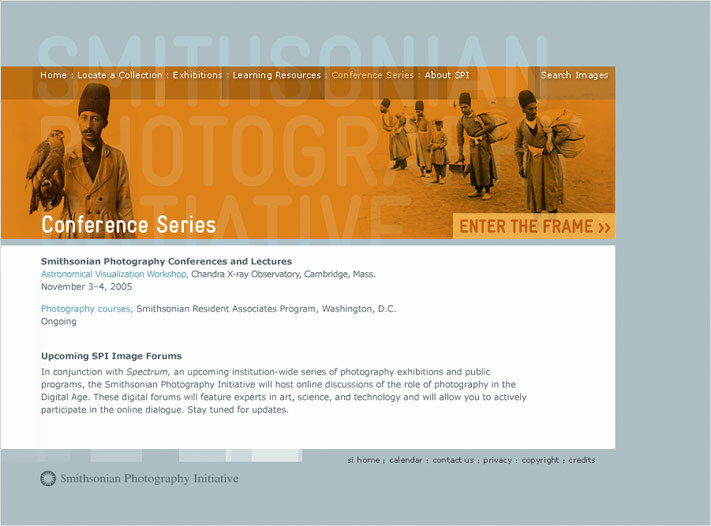 To advance its educational mission, the Smithsonian conceived the Smithsonian Photography Initiative (SPI) as a virtual portal into photography at the Smithsonian, aggregating assets from more than 17 museums and galleries and numerous research facilities. SPI selected Cabengo as its conceptual partner during the initial planning stages of the project, and then, two years later, selected Cabengo as its interactive partner, this time, to brand, design and develop SPI’s online museum. 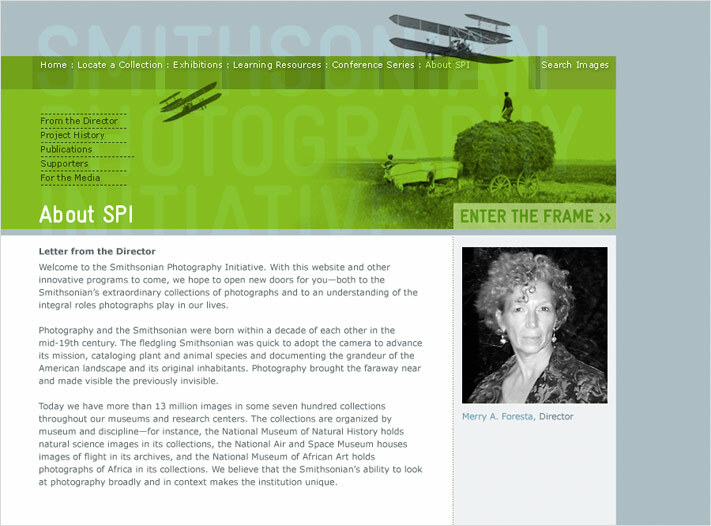 As the core presence for SPI, the website needed to establish the new museum in the field, promote core SPI activities, and provide content and visual literacy tools that helped users not only access Smithsonian photographs but also experience new ways of seeing. 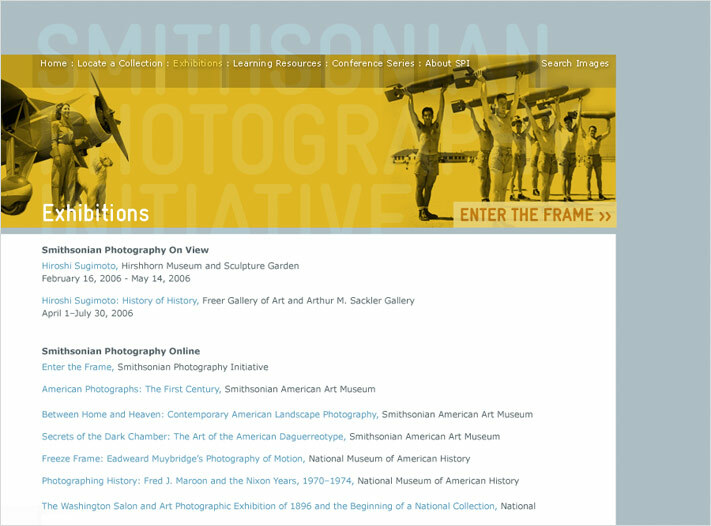 To meet this need, Cabengo created a clean, contemporary look and feel that conveys the vitality and relevance of Smithsonian photographs to 21st century life. 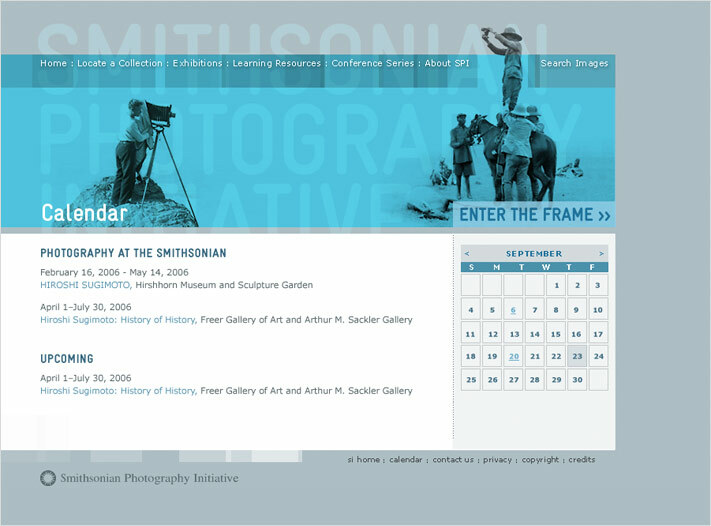 The website presents Smithsonian photographs as images rather than artifacts, and in so doing, brings fresh perspective to images often narrowly classified as historical artifacts. 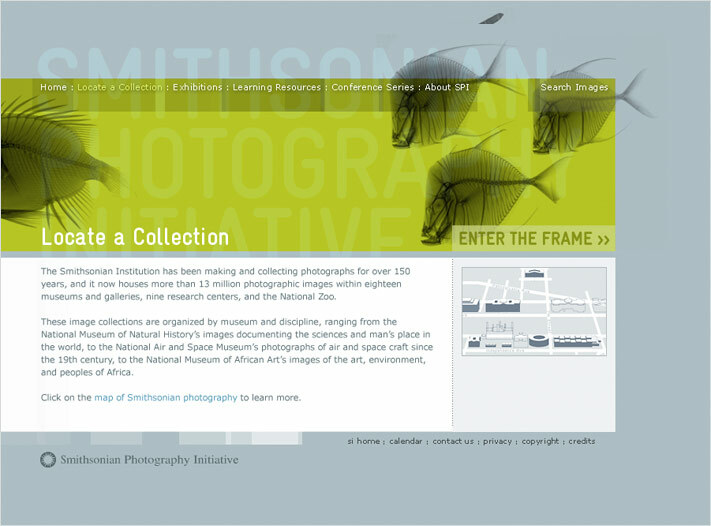 A series of introductory animations on the homepage convey the range and depth of Smithsonian images in a lyrical, sometimes humorous way. 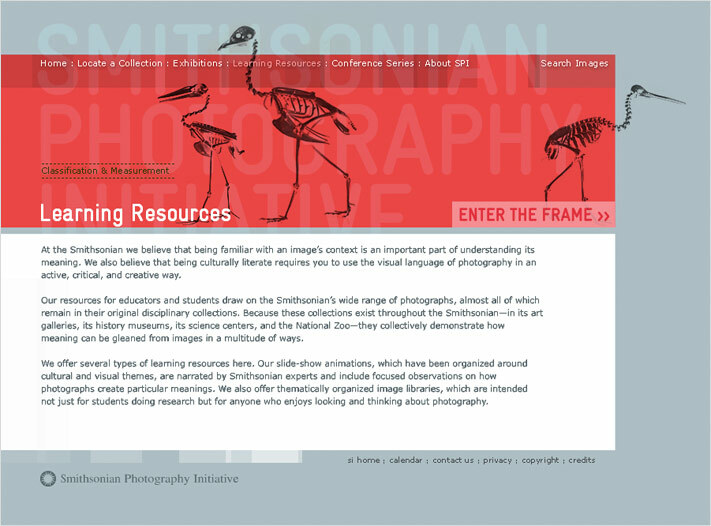 Here, rich media is used to show, rather than tell, the story of how photography is the common language among Smithsonian collections. Conceptually, the site needed to enable the democracy of meaning to flourish while at the same time, convey the institution’s “expert” point of view. Cabengo embraced this seeming contradiction by creating a site that celebrates both: site visitors can access “expert” classifications and tag images with their own keywords, creating a dynamic, user-defined taxonomy. This socially constructed classification scheme can help us to understand not only what these photographs mean but how photographic meaning itself is constructed. 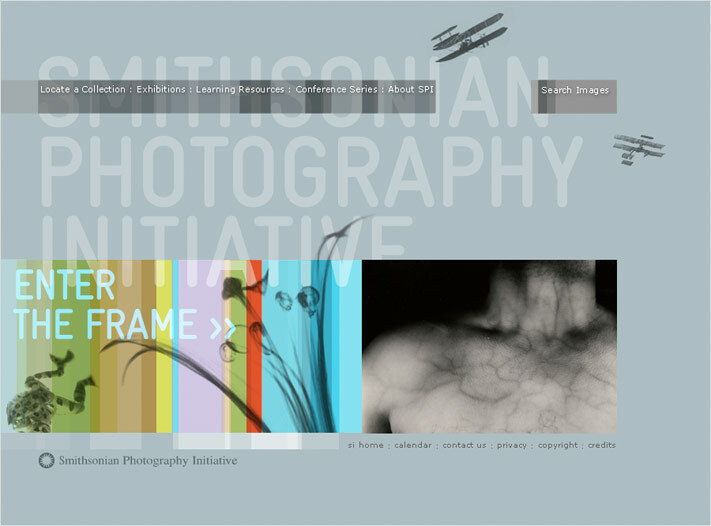 It also strengthens the Smithsonian’s identity as an institution that is continually exploring how new technologies can advance the field of photography and modernize museum practice. A robust multi-criteria search provides a direct path to search the database of images. 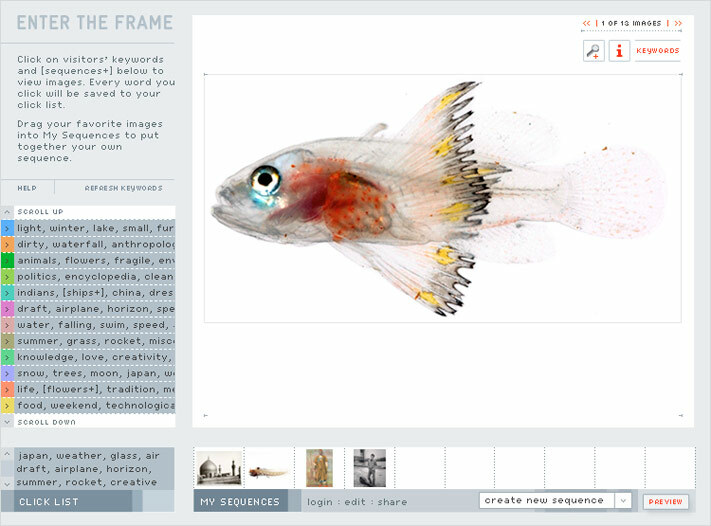 A keyword-driven flash feature, Enter the Frame, invites site visitors to explore the language of imaging, in a highly interactive and entertaining way. The crisp, scalable interface offers the visitor a fluid subset of keywords, organized by collection. The visitor can click on popular keywords and sequences, view images and sequences, and create and share their own sequences. An interactive gateway to the collection, Enter the Frame allows the visitor to experience photographic meaning as relative, dynamic, and transformative. Cabengo also developed a custom content management system, including a robust image upload form to enable non-technical staff to upload and categorize tens of thousands of images.